Clive Town Center Master Plan — LT Leon Associates Inc. 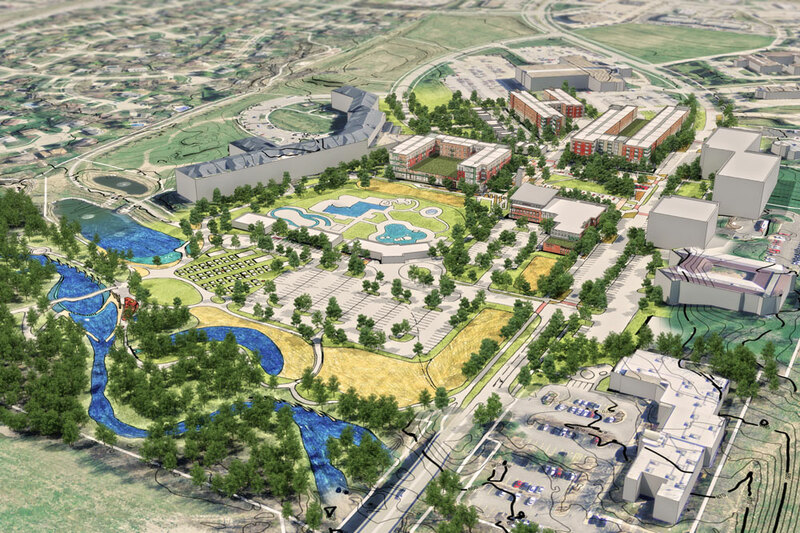 The City of Clive conducted a study for a new Town Center Neighborhood that included the Government Center. LT Leon assisted the urban planner, architect and traffic engineer with the planning for this compact, active, and sustainable town center. The study involved a collaborative effort between the City, citizens, private development community, and the planning team. Recommendations for the town square, pedestrian friendly streetscapes, public greenscape, stream and floodplain restoration, stormwater management, low impact development strategies, and public art were developed by the planning team. LT Leon helped develop concepts, analyze feasibility, and estimate costs for a riparian park and stream restoration along Walnut Creek. The goals were to re-connect the creek to the floodplain, enhance floodplain function, stabilize streambanks, provide fish habitat, and provide opportunities to connect people to the water. The stream restoration plan included natural channel design techniques, such as rock cross vanes, toe wood structures, and bioengineering. Plans to enhance floodplain function and improve water quality included native plantings, oxbow/wetland restoration, and redirecting City storm sewer to naturalized stormwater filter areas in the floodplain instead of directly to the creek.